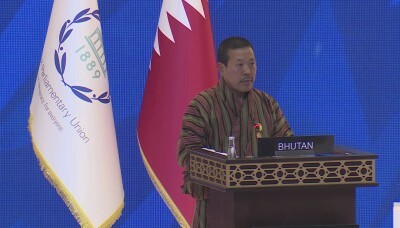 Tshogpon Wangchuk Namgyel, Speaker of the National Assembly of Bhutan addressed the 140th IPU Assembly in Doha, on the Bhutanese perspective of enhancing Education for Peace, Security, and the Rule of Law. Speaker reiterated about the unique transformation of democracy in Bhutan, an evolutionary democracy that the people across the world envy and look up to. He shared about Gross National Happiness, a development approach which makes a fine balance among material growth, conservation of environment, preservation, and promotion of culture and good governance is maintained. He said that, Parliament has always accorded highest priority for education and the state provides free basic education to all. Parliament through various legislations strives to ensure progressive peace, justice and the strengthened rule of law towards greater peace and happiness in the country. Speaker urged the delegates of the Assembly to work together and collaborate with unified efforts towards enhancing and ensuring the fundamental right of every individual to enjoy peace, security and to be governed by the rule of law and to lead a respectable life. He conveyed the warm greetings of His Majesty the Druk Gyalpo and the people of Bhutan to the delegates of the Assembly. The 140th IPU was attended by 80 Speakers and 1600 Parliamentarians from 160 countries around the globe. IPU will close on 10th April 2019.